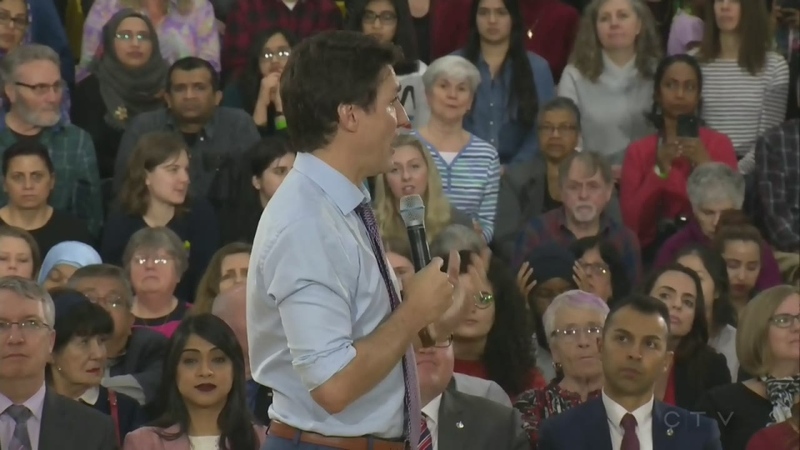 It was a packed crowd at St. Benedicts Catholic Secondary School filled with people waiting for a chance to hear from Prime Minister Trudeau and ask questions of their own. Trudeau faced a wide range of topics, from climate change and the carbon tax, to the opioid crisis and questions about immigration. On the topic of climate change and the carbon tax, Trudeau stood firm on his government’s policy of taxing pollution. “As with any complex issue like this, there is no simple solution, and we need to look at a whole range of approaches,” said Trudeau. On the topic of education, a portfolio under the provincial government’s mandate, Trudeau says he is concerned about what he has seen recently. “I am worried about cuts to education," said Trudeau commenting on some of the recent decisions made by the Ford government. Trudeau is staying in Waterloo Region for another day, attending a Liberal Party fundraiser at the Delta Hotel in Waterloo Wednesday morning. Later in the day, the Prime Minister will be at Kitchener City Hall to meet with the region’s mayors and chair Karen Redman.